Freediving is a popular new way to explore what is beneath the wave, staying as long as you can hold your breath. As opposed to just swimming on the surface, a Freediver will be swimming vertically for depth dives or horizontally for long time dive. Freediving is much more popular as a competitive activity. 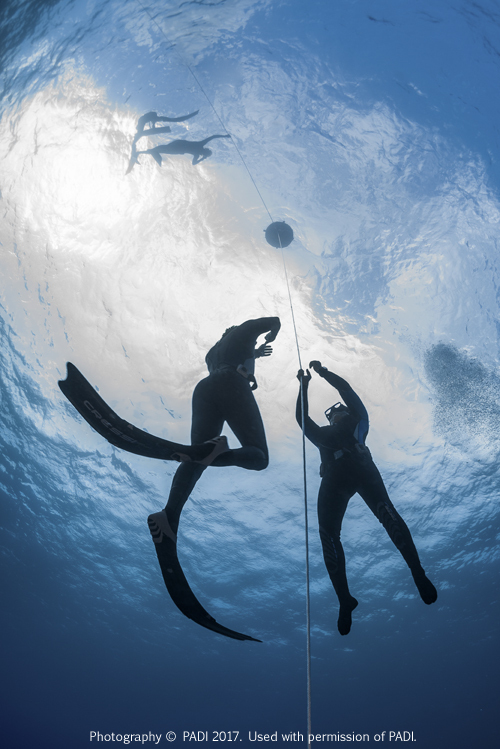 During the course you will of course learn the basic freediving principle which is focused on breath hold techniques, as well as static and dynamic apnea, plus proper buddy procedures. During your PADI Open Water Diver course, chapter 5 gives you the option to learn how to skin dive. Skin diving is snorkeling just below surface while making breath-hold dives to observe aquatic life, up close and personal. It’s a great way to explore the underwater if you are short in time to slot in scuba diving during your vacation, or you are just at the beach to enjoy some sun time. Enter, Freediving. A popular new way to explore what is beneath the wave, staying as long as you can hold your breath. Freedivers will be swimming vertically for depth dives or horizontally for long time dive. Freediving is much more popular as a competitive activity. Excited? You should be because Seaventures Dive Rig offers PADI Basic Freediving course. The PADI Basic Freediver course is a subset of the PADI Freediver course. It’s a great way for developing solid freediving skills by learning the basic freediving principles, focusing on breath hold techniques in a pool or confined water site. To enroll in a PADI Basic Freediver course you must be 12 years old or older. You need to have adequate swimming skills and be in good physical health. No prior experience with snorkeling, skin diving or freediving is required. If you are younger than 12 years old, 8 year olds and older can enroll in the PADI Skin Diver course. Knowledge development and confined water session to learn breathhold techniques as well as static and dynamic apnea, plus proper buddy procedures. Goal – static apnea of 90 seconds and dynamic apnea of 25 metres/80 feet.